Rethinking Faith and Church: Atheist Mega-Churches: The Latest Offering in the Religious Milieu? Atheist Mega-Churches: The Latest Offering in the Religious Milieu? I was looking through our local newspaper this Remembrance Day (Veterans Day for my American friends) and saw the following headline: “Atheist ‘mega-churches’ gain a following in the U.S.” It featured a picture of an attendee reaching for a brochure that was flanked by what looked like bumper stickers proclaiming: “BORN AGAIN HUMANIST,” and “GOD-LESS IS MORE,” and “I BELIEVE IN LIFE BEFORE DEATH.” Needless to say, this caught my attention. The first thing I thought was, how ironic that on a day set aside to commemorate our veterans who, among other things, fought to preserve a way of life in a nation that was built on “Christian” values and principles, I’m reading of the formation of atheistic mega-churches. However, I then just as quickly ended my digression from the newspaper story and acknowledged that we haven’t been a truly Christian nation for a very long time, and so, whatever; to each their own. The “worship” service included a lot of stomping of feet and clapping of hands to songs like “Lean on Me” and “Here Comes the Sun.” While clearly not gospel songs, it doesn’t take much to see that songs like these could easily be Christianized (assuming they haven’t been already) to work in non-atheistic churches as well. After all, I’ve long since argued that, with a few notable exceptions, what often passes as Christian music today is very theologically incorrect. But that’s a topic for another time. I find it interesting that, though the word “church” has long since evolved from its original meaning of “the Body of Christ,” just about every faith (and now non-faith) today has a “church.” Cults such as the Mormons have churches, eastern religions like the Buddhism have churches, and of course, Christians have their churches. But at the end of the day, what we’re really talking about is, they all have their respective institutions. Call it what you want; church, temple, kingdom hall, mosque, shrine, or something else, these are all simply places where like-minded people of like-minded faith (and non-faith) gather. So what if there are now atheist mega-churches added to the religious milieu? Have not all people the right to meet together as they see fit? Of course they do! But apparently it’s not all coming up smelling of roses. 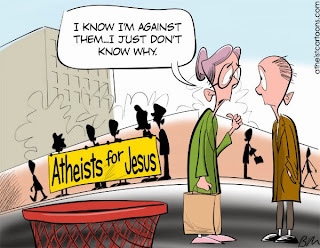 The newspaper article went on to report how one self-described atheist said, “There’s something not OK with appropriating all of this religious language, imagery and ritual for atheism.” In other words, as uncomfortable as the concept of atheist mega-churches no doubt is to some Christians, it is equally uncomfortable to some atheists. Well, there you have it. Just as Christian churches have long since known the rift of division and factions in their midst, so too at the inauguration of atheist mega-churches, there already appears to be a “doctrinal” split as well. Maybe what we’re really seeing here is the “genesis” (pun fully intended) of atheistic denominations. 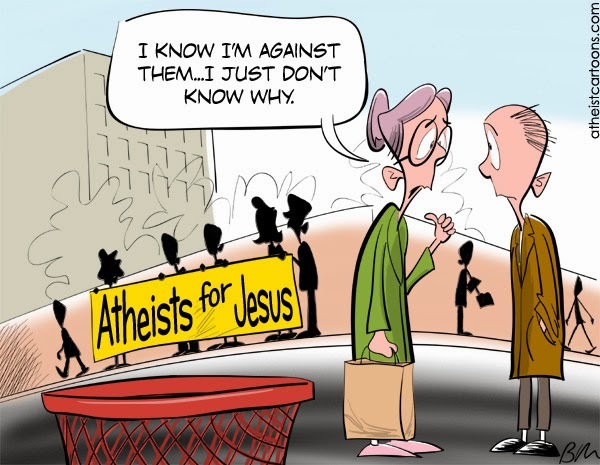 Maybe atheists are a little more religious than they previously thought. Hmm. Just a thought. Peace. I know some non-atheistic churches of which the same could be said. Peace. Yea, me too (unfortunately). Thanks for the comment. Peace. As much as man does his best to insert God into a brand of religion and institutional church services, I don't think God is attending or taking part in any of them. Man sure does like to put God in a box and control the situation for a number of misguided reasons.